In primary biliary cirrhosis, inflammation destroys the bile ducts and prevents bile from escaping the liver. The accumulated bile damages healthy liver tissue, eventually leading to cirrhosis (scarring). 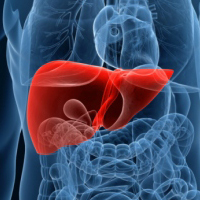 As scar tissue replaces healthy liver tissue, the liver loses its ability to function. What Are Biliary Cirrhosis Life Expectancy & Symptoms? All this happens very slowly. People with PBC can lead healthy, symptom-free lives for 10 years or more after diagnosis. Though primary biliary cirrhosis is often asymptomatic, especially early on, the most common symptom is extreme itching, especially in the arms, legs and back. Other symptoms include fluid buildup in the abdomen or legs, jaundice (yellowing of the eyes and skin), or fatty deposits and darkening of the skin under the eyes. The standard treatment for PBC is a daily dose of a medication called ursodiol. Ursodiol improves liver function and increases life expectancy in people with PBC. Other medications may be indicated for controlling symptoms.